Tommy Smyth has a lot to say about football, or soccer as Americans know it. 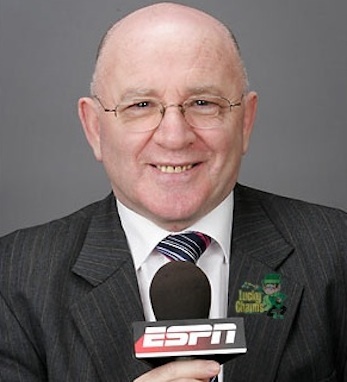 Smyth has one of the most recognizable Irish broadcast voices in the world as he has been a sports broadcaster and soccer analyst on ESPN since 1993. While working for ESPN, Smyth has done commentary on many international games, the UEFA Champions League, and even several world cup matches. However his commentary isn’t limited to sports. Smyth’s voice can be heard on WNBC on St. Patrick’s Day as he serves as a commentator for the New York City parade. In 2008, he was chosen as the 247th Grand Marshal for the celebration. Tommy Smyth is particularly known for his memorable trademark comments during games. He is often heard calling a goal “a bulge in the old onion bag.” He signs off every commentary saying “Tommy Smyth with a Y,” making sure no one forgets his name.